Our4 ha vegetable garden really is the heart of the Babylonstoren farm. Each one of the 300 varieties of fruit and vegetables grown there is edible, and you can see exactly what we grow in our garden here. Every morning one of our waiters goes out with the garden staff to harvest the fresh produce of the day, and the food they pick is included in our menus, both at Babel restaurant, as well as at the Tearoom. Here are Julian and Constance busy harvesting this morning’s crop of violets, and tomarillos too. If you’d like to find out more, we have a daily hour guided garden tour, starting at 10am, and taking about 1.5 hours to complete. Please remember that bookings are essential, and you can make a reservation by email at: enquiries@babylonstoren.com. 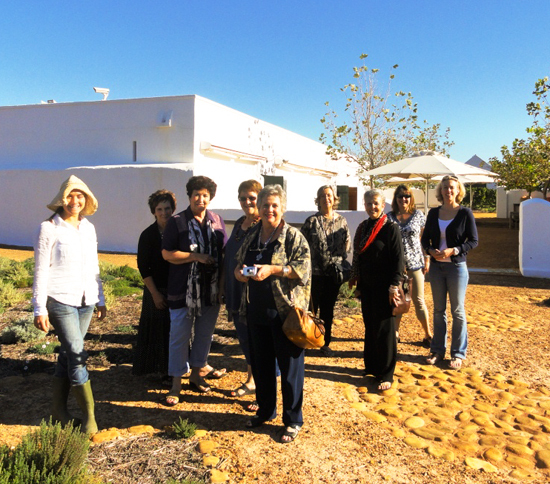 Today’s garden tour was led by Constance-Marie, and here is the group of friends who took the tour just before setting off this morning.